Name: The Honourable Robert Leith Hanbidge, Q.C. Eminent Chancellor: I present to you the Honorable Robert Leith (Dinny) Hanbidge, Q.C., K.St.J., Lieutenant Governor of Saskatchewan. Mr. Hanbidge, our beloved Lieutenant-Governor, has had a long and distinguished career in the service of this Province. 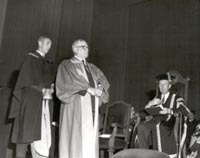 Born and educated in Ontario, Mr. Hanbidge moved at an early age to Western Canada where he proceeded to take the Saskatchewan Law Society Law Course. In 1909, he articled with the law firm of Sir Frederick Haultain, former Premier of the North West Territories. He was made a member of the Saskatchewan Law Society in 1915 and was appointed K.C. in 1933. He practised his profession for many years in Kerrobert as a member of the firm of Hanbidge, Lewchuk and Mentiplay. At various times he has been member of the Saskatchewan Legislature, member of the House of Commons, delegate to a NATO conference in Paris, delegate to a Commonwealth Parliamentary Association Conference in London, England. On the more serious side, he can claim membership in the champion Regina Roughriders Football Club - 1911-12-13. On the civic side, Mr. Hanbidge was councillor and mayor of Kerrobert, chairman of the School Board, chairman of the Hospital Board, chairman of the Board of Stewards of the United Church at Kerrobert. Small wonder then that in 1963, Mr. Hanbidge was appointed Lieutenant-Governor of Saskatchewan. Mr. Hanbidge has performed the duties of the office of Lieutenant-Governor with great dignity and natural charm and his reappointment this year for an additional term of one year gave universal satisfaction. Mr. Hanbidge was greatly assisted for many years by his dear wife, Jane, whom we greatly miss today. Eminent Chancellor, on behalf of the Council and Senate of the University, I ask that you confer the degree of Doctor of Laws, honoris causa, on Robert Leith Hanbidge, universally respected first citizen of the Province and worthy representative of Her Majesty Queen Elizabeth the Second.